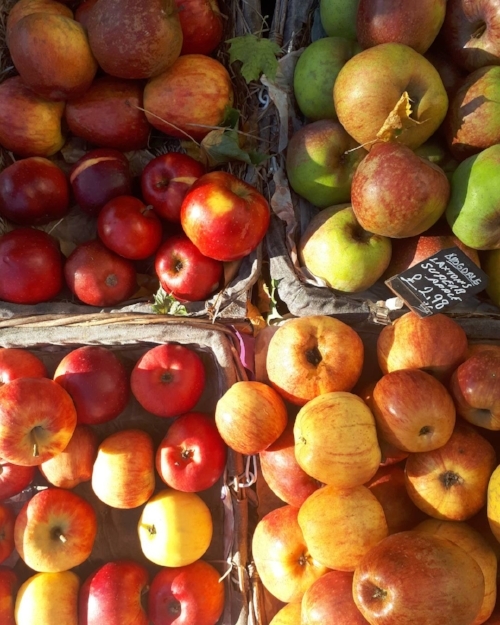 Across England, baskets and boxes outside greengrocers, and at farmers’ markets, are filled with squashes and apples. I’m so thrilled that November has finally arrived. Around Bonfire Night, when the air smells of wood smoke, the mornings are cold and grey, and fog settles over the city in the evening, I can't imagine anywhere I would rather be. If there are 'seasons' for different cities, then autumn surely belongs to London – the parks carpeted with fallen leaves, the first suggestions of the Christmas season in shop windows, the heavy grey skies providing unrivalled backdrops to Victorian terraced houses. It’s my favourite time of year for food too; I look forward to the English apple season all year. It was a year ago that I read The Light Years, the first in Elizabeth Jane Howard’s Cazalet Chronicles. I fell for its charms immediately, and have strictly rationed the next four in the series – I’ll be reading one each summer until I’m 33. This second book leaves behind the easy summer of the first; it is now 1939, and Britain has been plunged into war. We see the story through the eyes of three teenage cousins: Louise, Polly, and Clary, as the multi-generational Cazalet family are faced with a changed landscape. I think, if possible, I loved the book even more than the first. Reading it, I was again struck by the proliferation of perfect meals but especially the apple-based desserts (of which there are many). And so I've been holding out for November to arrive. I initially considered making the apple strudel Louise eats a few chapters later but, honestly, the idea of patiently stretching pastry until it is thin enough to read the Saturday paper through felt like a job for another weekend, when I have time and energy to dedicate to the task. This week, I wanted an apple charlotte. It’s a dish I haven’t eaten nearly enough: apples baked within a layer of butter-soaked bread. I’m struggling to imagine anything I’d fancy more on a cold autumnal night. Instead of offering a dense, soggy layer around the fruit, as in a summer pudding, the bread in a charlotte crisps and browns in the presence of butter, functioning more like a layer of pastry. But as much as I love any excuse to have bread and butter for dessert, the stars here are the apples – so it is worth considering which ones you fancy putting into it. A dear friend pulled an Ashmead’s Kernel from her backpack last week, an apple she’d carried for me from Gloucestershire. Its skin like tarnished metal, a dull faded gold, it is my platonic ideal apple – sharp and crisp, and smelling unmistakeably autumnal. It would be good here, its firm flesh holding shape inside the casing of bread and butter. It’s a simple dessert, but a special one, showcasing the best this season has to offer. 1. Melt 30g of the butter in the large saucepan, and tip in the apples. Add the sugar, bay leaves, and cinnamon, and cook over a medium heat until the cooking apples have lost their shape and the eating apples are soft and yielding – about 15 minutes. Set aside to cool. 2. Slice the crusts off the bread, and slice each piece into thirds. Melt the butter in the second pan. 3. Prepare your tin/pudding bowl: I like to line my tin with a piece of greaseproof paper, just to ensure the charlotte will drop out easily. If you’re using a pudding bowl, a disc of paper at the base may provide reassurance. Dip each piece of bread into the butter, and use them (butter side to the tin) to line the tin/bowl. Overlap where necessary, to ensure there are no gaps. There should be bread right up to the edge of the tin/bowl. Make sure you have about a third of the bread left at the end to do the top. 4. Fill the tin/bowl with the cooled apples (don’t forget to pull the bay leaves out), pushing them into the corners. Place a layer of the butter soaked bread on top, with the butter facing up. Squidge the edges of the bread together to seal it, place a board or plate on top, and then use something from your pantry to weigh it down. 5. Leave the weight in place for 30 minutes and preheat the oven to 180C. Remove the weight and board/plate, and bake the apple charlotte for 45 minutes, until golden. Allow to cool in the tin a little, and then invert the tin onto a serving plate. Serve in big slices, with crème fraîche, ice-cream, custard, double cream – whatever you fancy, really. Apple Dumplings. The Magic Pudding. The tea and sugar and three tin cups and half a pound of mixed biscuits were brought out of the bag by Sam, while Bill cut slices of steak-and-kidney from the 'Puddin. After that they had boiled jam roll and apple dumpling, as the fancy took them, for if you want a change of food from the 'Puddin, all you had to do was to whistle twice and turn the basin round. Last Sunday, I went for a long walk. I kicked crunchy autumn leaves, watched pheasants dash across my path, pulled a ripe apple from a tree, and saw the sky turn from blue to purple to inky black. It was idyllic; I couldn't have constructed a more perfect autumn evening. These months are, without question, my favourite of the year. And while I appreciate being able to sit under a blanket and read, surfacing only for endless rounds of tea and toast, autumn is also the season that makes me want to get out and walk. To put on a backpack, collect fruit from the trees, and get lost in forests. And to crunch down on apples; it seems I just can't get enough of them. I have spent some time, in the past few weeks, working as a cook on an estate; making Sunday lunches, and filling the fridge and freezer with dishes for the week. Before I arrive, I am sent a list of what has been growing well in the garden, so that I can incorporate the produce that is picked mere metres from where it is to be eaten. After years in balcony-free London flats, with an often failing collection of herbs on my windowsill, walking around this garden is pure bliss. It is exciting, and inspiring. Lining the centre path, obscuring the view of the kale, celeriac and squashes, are apple trees. Different varieties grow side by side, with everything from tiny yellow apples, to dependable russet ones, to enormous green cooking ones, begging to be picked and eaten. For years, when I considered what might be my favourite fruit (I spend an inordinate amount of time contemplating this very thing), apples didn't even enter into the equation. If I could lay my hand to stone fruit, or berries, or a ripe Queensland mango, I was happy. An apple was for school lunch boxes: dull, predictable, too soft, too bruised - especially after being bashed about in my school backpack all morning. Delicious winter apples from Stanthorpe almost changed my mind, but it wasn't until I moved to England that I truly appreciated their brilliance. I love the sound they make when you bite into them, as if all the crispness of a great autumn day was held in a single piece of fruit. I love their sharpness, and the way they marry so well with both sweet and savoury flavours. This past weekend, I put them in a sausage stew, a pie and a pan of beetroot soup; they're a friend in the kitchen, as well as straight from the fruit bowl. And so, although I adore a perfectly ripe peach, the kind that sends sticky juice down your chin, and the wonderful moment when you smell the first strawberries of summer, if I could have only one fruit, the apple would be it. 1. First, make your pastry. It needs to be rested, so you can do this in advance, if you like, and store it in the fridge until you need it. Rub the cold butter into the flour until the mixture resembles breadcrumbs. Add the salt, and then the egg yolk, combining the mixture with your hand. If it hasn't quite come together, add a little water, stopping as soon as the dough is damp enough to form a ball. You don't want it too wet, or it will shrink in the oven. Once it has come together, wrap the dough in the cling film and rest in the fridge for an hour or so. 2. Heat your oven to 190C. Peel and core the apples, rubbing their exposed flesh with lemon to prevent them from going brown. Melt the butter, and then stir in the currants, sugar and cinnamon. Push this mixture into the hole left by the removal of each core. Set the apples aside while you ready the pastry. Roll it out into a square around 2mm thick, and then cut into four equal squares. 3. Place an apple in the centre of a square of pastry, and gather the corners around the apple. If it isn't quite big enough, remove the apple and roll the pastry out a little more thinly. Pull the corners to the top of the apple, and then pinch the folds that form closed. Press these pastry folds around the apple, using them to cover any cracks or holes. Don't worry too much about the design here; the basic purpose is to cover your whole apple in pastry; do it in a way that makes sense to you. Cut a leaf for each apple out of any leftover pastry, and use it to cover any pastry gap at the top of the apple. 4. Paint the pastry with a beaten egg, and sprinkle the top with a pinch of sugar. Bake in the oven for 45 minutes, keeping an eye on the pastry, and covering it with foil towards the end if it is browning too quickly. 5. Serve the apples with cream or, as I did, with salted caramel sauce (Nigella Lawson's is perfect, of course).